In December 2014, I wrote my first blog regarding sepsis, and outlined the signs and risks of the condition and instances where medical negligence can occur. In September 2015, I wrote another blog which was aimed at highlighting how sepsis was the ‘silent killer’ we needed to know more about, and ways we could stop it from killing someone every three and a half seconds. It is now January 2016, and I find myself reading yet another heartbreaking story as a result of sepsis. I was deeply touched by this latest story and knew that I had to share. This is William’s story. William Oscar Mead was only one year old when he passed away from sepsis on 14th December 2014. In her blog, his mother Melissa explains that he had been unwell in the week before, and had been seen by doctors for a temperature of 40.1°C. Finding no rash or chest problems, doctors recommended Nurofen and Calpol and reassured his parents he would be fine. The next day he continued to be unwell, and was lethargic, vomiting bile and had a persisting temperature. A doctor advised that it was likely to be a viral infection and suggested plenty of rest. By the next day, William had sadly passed away. “As a family we had heard of sepsis but assumed it was rare, that [it] was something people caught in hospital. This is not the case and it is so far from the truth, it’s astonishing”. “I hope by fundraising we can raise awareness of sepsis, through innovation, research and the sharing of good practice. Sepsis needs to be recognised as a medical emergency and as a clinical priority for the NHS. We need to ensure that members of the public, patients and their relatives, and health professionals work together to think sepsis”. Paul and Melissa are working with the UK Sepsis Trust, a charity that raises awareness of the condition and supports those who have been affected, and speaking out about the dangers of sepsis and early detection can save lives. They are donating the fee they receive from sharing William’s story to the UK Sepsis Trust. I first met Melissa at a Pizza Express near Bristol. I’d read her blog of course- such an incredibly powerful, fragile, honest description of the beautiful little boy cruelly and suddenly taken from his family. Little did I know that William’s mummy would be such an inspiration in real life. William is not an isolated tragedy. Unbelievably, we estimate sepsis to claim 1,000 children’s lives every year in the U.K- that’s almost 3 children dying every day. Some might not be avoidable. Too many are. Few parents have to utter the words ‘when my child died’. We now know that Melissa and Paul shouldn’t have had to, yet in the face of this anguish they continue to honour William’s memory by turning his tragic death into something positive. Together, we are on this road to saving lives from sepsis. In September 2015, Melissa and Paul joined us in Westminster to further our aim to get HM Government to take steps to tackle sepsis. The Secretary of State for Health listened as we shared William’s story; I held William’s beloved teddy while addressing him to reinforce that this was just a little boy who might have been saved. Four months on, and Melissa is still fighting. Her determination to fight for the answers to her questions about William’s care during his last days has led to this new report from NHS England. It highlights that lessons need to be learned- that health professionals need to be more aware, that they need to take and record observations when faced with a sick child, need to provide written information for parents as a ‘safety net’ when children are being looked after at home, that our health system needs to be better at sharing and collating information. Early diagnosis and intervention is key to saving lives. This is particularly important for children, who cannot speak out and are weaker and vulnerable. The UK Sepsis Trust has found that doctors, as well as the public, still need help in identifying sepsis and administering appropriate treatment. To help, they have published a range of ‘toolkits’ which offer guidance on what symptoms to look out for, and what action to take. The overall objective is to reduce preventable deaths and, in turn, avoid negligence. In September 2015, the Trust launched their Clinical Toolkit (pdf) 6: Emergency Department Management of Paediatric Sepsis. This is aimed at helping doctors in the Emergency Department identify and manage sepsis in children. As the symptoms of sepsis can be vague, most children will attend the Emergency Department for their initial assessment. Accurate diagnosis: it is not enough for a child to be diagnosed with “sepsis”. Healthcare professionals must be more specific and note the exact type, using specific terms “septic shock”, “severe sepsis”, “red flag sepsis”, “uncomplicated sepsis” or “no current evidence of sepsis”. The toolkit defines each term. Quick action: any diagnosis or suspicion of red flag sepsis, severe sepsis or septic shock requires treatment within an hour. If in doubt, a clinician experienced in paediatric sepsis must be consulted. 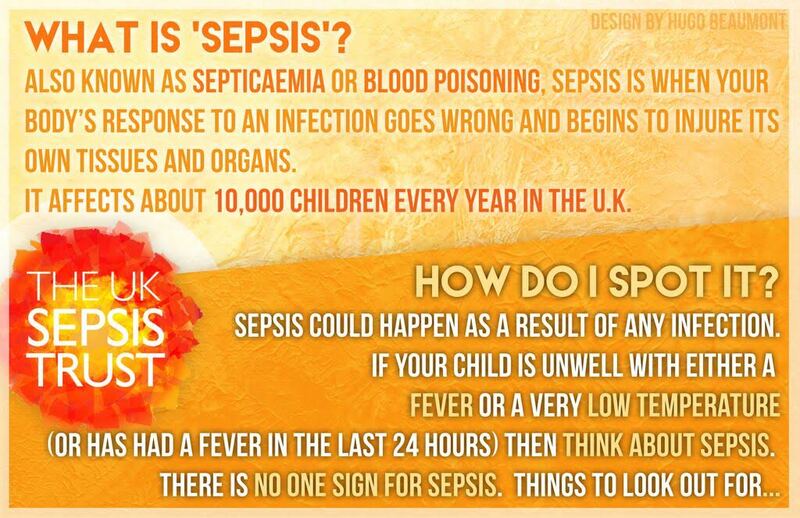 Senior medical input: initial symptoms can be vague and not all children with an infection will have sepsis. The toolkit suggests review by a senior doctor within 60 minutes of diagnosis or less, depending on the severity of the sepsis. Further details about this toolkit can be found in my article for the Health Service Journal. The horrific reality is that had there been better awareness, communication and effective safety netting, William might still be here. The incredible truth is that his mummy is not asking ‘what if?’ She’s asking how she can play her part in honouring William’s memory by stopping the unthinkable happening to other parents. By this, Melissa, we are blessed. If your child has suffered an injury due to unacceptable medical treatment, they may have a right for a legal claim for compensation. Whilst no amount of compensation can ever come close to making up for painful injuries and time lost, it can go some way to help repair the patient or family’s life. Importantly, a legal claim will ensure that the care provided to your child will be thoroughly assessed by a team of lawyers and independent medical professionals. That this caused an injury over and above that which would have been suffered in any event. At Bolt Burdon Kemp, we understand that suffering medical negligence can throw your entire world into turmoil. We are here to help you each step of the way to getting the answers you deserve. My colleagues and I specialise in medical negligence and will do everything we can to take the pressure off you so you can focus on moving forward. We do this by providing all our clients with access to practical support services, to help them cope both physically and emotionally with their daily lives.